God’s in his heaven, all’s right with the world. The words, surprisingly enough, came from Leonard Cohen, and he was making the first of several efforts to bring the opening show of his British tour to a close. So surprising were they, from this supposed apostle of gloom and despair, that I had to ask him, afterwards in his dressing room, while he dealt patiently and warmly with a seemingly endless line of fans who came in for autographs, handshakes and even hugs and kisses, if this summed up his current mood. He smiled, that slow, broken smile of his, that somehow doesn’t quite reach the eyes, but which is far from being insincere. Nevertheless, it seemed to me that the whole mood among the Cohen entourage, which has often been so heavy on past tours, was so up, and especially his band, that I wondered if he had now put all thoughts of retirement firmly behind him. “I never made a real retirement plan,” he said. “That was just something that came out of a conversation with a music journalist I had one time when we were talking about our disillusion with certain aspects of the music business, wondering why we ever got into it. You know that sort of conversation that two guys will have, at about 7 o’clock at the end of a bad day. Nevertheless, judging by the amount of new material in his show, he was now in a prolific phase, whereas for a while, during his supposed retirement, he’d seemed to be lying fallow, I insisted. That’s the other big news, besides this new, sunnier mood. He has written another novel, his fourth, and the second not to be published. He has just withdrawn it from his publishers, something which didn’t seem to bother him at all, considering the amount of time it must have taken. “It was about my family and I thought that it wasn’t honest enough. In other words, it would hurt them, but it didn’t have the good side. So I took it back at the last moment. “But I feel good because it’s written. As somebody once said, it’s just as hard to write a bad novel as a good novel, and it’s just as hard to write a novel you don’t publish as one you do publish. 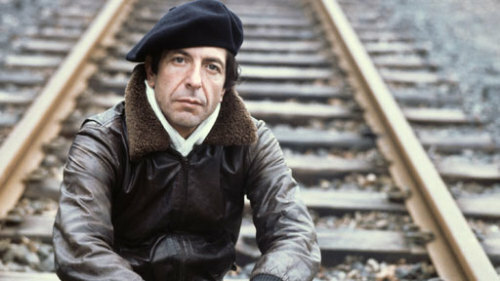 Accuracy means a lot to Cohen, and though some might complain that his lyrics are sometimes obscure, to him the use of an intensely personal poetic metaphor is strictly in the interests of getting across an experience in an almost documentary fashion. There was, for instance, a real Suzanne, which seems to me self-evident, but some have doubted her reality. “‘Suzanne’ was written as a song. It took about a year. First of all I got that movement” (shaping his fingers to fret an imaginary guitar) “you know, in that E position. “I was living in Montreal and I did feel like there was a song for me down there. The little church down there. Our Lady of the Harbour, and you feel it, I felt there was a song for me there and the girl did invite me down. “It’s very documentary, very accurate. People say, ‘Did you make that up?’ or something like that, but most of the songs are as accurate as I can make them, to the event. So where did the poetry come in? With such personal lyrics it seems that the songs must serve some psychological function, probably cathartic, but Cohen says no, seeing himself as a tradesman pure and simple. “I don’t know what it is. It becomes your work, one of the few things you know how to do, especially as you get older. The premise, when I examine it – and I don’t examine it too often – I’ve always felt that the more personal you get, the more universal the application, rather than the other way around. “If you begin to address yourself to the masses like that, then I suppose you could have a hit, but to me the more accurate you get about your situation, then the more accessible it is to other people. “People say they don’t understand the stuff, but I never believe that. It’s like understanding an embrace, if you ask somebody after the embrace, ‘Did you understand it?’ D’you know what I’m talking about? “But in the midst of the experience…it’s like that Jesus verse in ‘Suzanne’, everyone knows what that means, but nobody can say what it means. Nevertheless, Cohen has never been the fame-spurning hermit. He has a deep, abiding affection for Nashville music – a relic of his youth, he says – and earlier In the conversation he had spoken approvingly of some of his songs as being good to do the washing up to. “I think we make too much of songs, anyway,” he said then. Was he still interested in chart success? He didn’t entirely answer the question, so I had to make what I could of a fairly oblique reply. “I guess there are some people who could just write a song for somebody else and let it go at that, but I have always felt that the nature of song was a movement from lip to lip. “That’s the nature of the thing. It’s somehow built into the design of a song, the fact that it moves around. And if it doesn’t, then it isn’t really that thing that we call a song. “It could be something else pretty excellent, it could be a poem designed to stand on a page or an esoteric document or a kind of a paradox that could exist on parchment, but you know, a song, its nature is that it moves. “You know I think I have an idea of where I am. There are major writers and there are minor writers. I consider myself a minor writer. That’s not just an exercise in modesty, because I love the minor writers, like Robert Herrick. “I’m not that kind of writer like Solzhenitsyn, a writer who has a great, great vision. I have a small corner. Former BBC and IRN presenter, presenter of jazz, classical, movie and talk shows on Bradford Community Broadcasting, editor and presenter of VideoCaroline, "the best TV over the Seven Seas". This entry was posted in Arts, Contemporary, Folk, Music, Rock, Songwriters and tagged 1976, interview, Leonard Cohen, Melody Maker. Bookmark the permalink.